The brilliant work of French musician Vincent Lanty. Over the past year alone, Vincent Lanty, the celebrated and critically-acclaimed French-born musician has performed at some of the biggest venues in Paris, including the Olympia and the Trianon. In addition, Vincent has collaborated with one of the hottest young pop stars in France, Lou. After discovering that Lanty’s work has already been featured in the New York Times of France, Le Monde, we too wanted the opportunity to spotlight his career and marvel at his seemingly overnight launch into the top echelon of French musicians. Lanty’s work as a composer, pianist, and music director has afforded him the opportunity to perform alongside some of the most important artists of the past two decades, including Celine Dion, One Direction, Rhianna, Alessia Cara, Little Mix, Rita Ora, Robin Thicke, Nelly Furtado, Carly Rae Jepsen – and international recording artists: Cris Cab, Zucchero, Jenifer, As Animals. Tao, Matt Pokora, David Garrett, Kendi Girac, Grance Gall, Joyce Jonathan, David Thibault, Ycare, Olympe, Pascal Obispo, Garou, Shy’m, Natasha St-Pier, Florent Pagny, Isabelle Bouley, Francoise Hardy, Emmanuel Moire, and Christophe Willem. The list, as this journalist quickly learned, goes on and on. In France, Lanty is already a household name. He performed alongside Rihanna for Def Jam and TF1’s hit show, The Star Academy, in the finale episode that had over 8.9 million viewers. He has been recruited by the top production companies internationally, including Columbia Records (performing with One Direction), Warner Bros. Television (The Voice), and Universal Music Group (performing with Cris Cab).When the call came to perform a duet with Celine Dion, Lanty confesses that he knew he “made it.” The performance was recorded in Paris, performed live on France 2, and viewed by millions. Lanty is known for more than just his accompaniment and brilliant ability as a composer. He also worked as the musical director for the hit French musical, Resiste, by the late France Gall. France Gall, considered to be French music royalty, personally invited Mr. Lanty to work for her on Resiste -where he took on responsibility for directing hundreds of performances and a team of over 35 of performers. While Resiste may not be a well-known musical in the United States, in France, it is considered one of the most important and most popular musicals of this generation. As Musical Director for Resiste, Lanty toured across France, Belgium, and Switzerland in over 200 different venues, and ultimately, the production topped the French music charts and received the Globe de Cristal award, one of the most prestigious awards in France. The Globes de Cristal Awards, bestowed by members of the French Press Association, recognizing excellence in French art and international culture. Lanty shows no signs of slowing down. 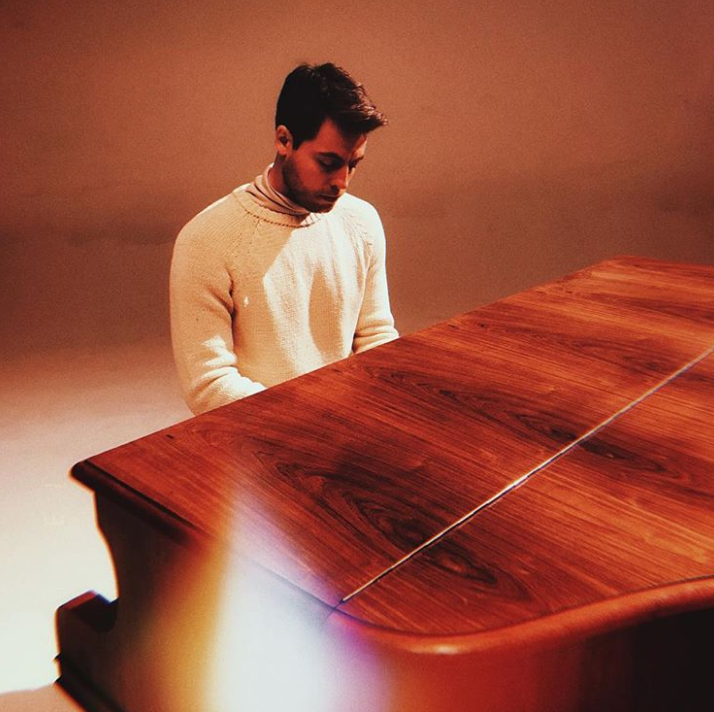 His powerful sound can now be heard in his newest release, the single “Qui Pourrait?” for the French popstar, Lou, that he wrote, composed and produced in 2019. The single has already reached over 1.8 million views on YouTube, resonating with young and adult audiences alike. The song strikes the listener the same way pop music did almost 30 years ago. It is predictive as a new style of French pop that again combines the sweet with the cool, allowing us to nod along and enjoy the simplicity of a good melody and a solid beat. This single is no one-off achievement for Lanty, however. In his key role as pianist, composer, and musical director, he tours with Lou around the world, and continues to do so across France, performing on The Voice, and at the Charleroi le Palais des Beaux-Arts, Casino de Paris, Olympia, and the Trianon in Paris. Lanty tells us that he has set his sights on the United States next, to continue working with some of the music industry’s top companies and artists, including Sony. As one of the only French musicians with such a massive CV of hits and collaborators, Vincent Lanty is certainly an artist to watch as he continues to dominate the international music scene.